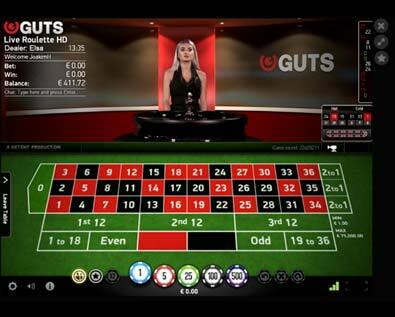 Guts Casino started its operations in 2013, while a number of players were already well integrated into the market. Because of the casino’s insistence to become the best in the business, the site is still doing very well. 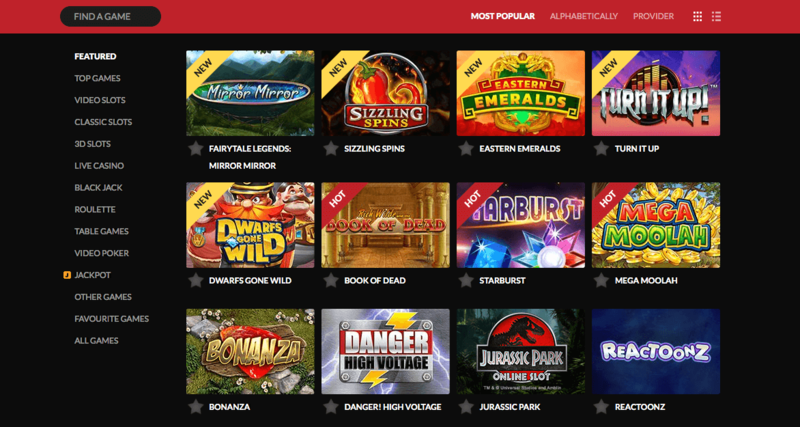 Right now there are over 750 games available on the site, with over 700 of them being slots. Other table games are also part of the portfolio so there is something for everyone to choose from. The casino is owned by a company that is well established in the business already, the MT SecureTrade Limited Casinos. It is affiliated with Gaming Innovation Group, which is part of the Norwegian Stock Exchange. The security of the company is hence the topmost priority. Given these circumstances, it is safe to say that Guts Casino is a place worth checking out. The Guts Casino is accepted in the countries which fall under the jurisdictions of the gaming license authorities. Other than those, Guts Casino has a long list of restricted countries, some of which are Belgium, Indonesia, France, Greece, Spain, South Africa, Kuwait, Malaysia, Turkey, Nigeria, the United States and many others. Check out the T&C to find out if your country is given access to the site. The Guts Casino has many things to offer to its players. Some of the significant ones will be discussed here so read on. Some of the biggest names out there are associated with the Guts Casino site. Some of the renowned software providers working as Guts Casino’s partners are NetEnt, Microgaming, Betsoft, IGT, Evolution Gaming, Quickspin, Thunderkick, NextGen Gaming, OMI Gaming, Red Tiger Gaming and others. 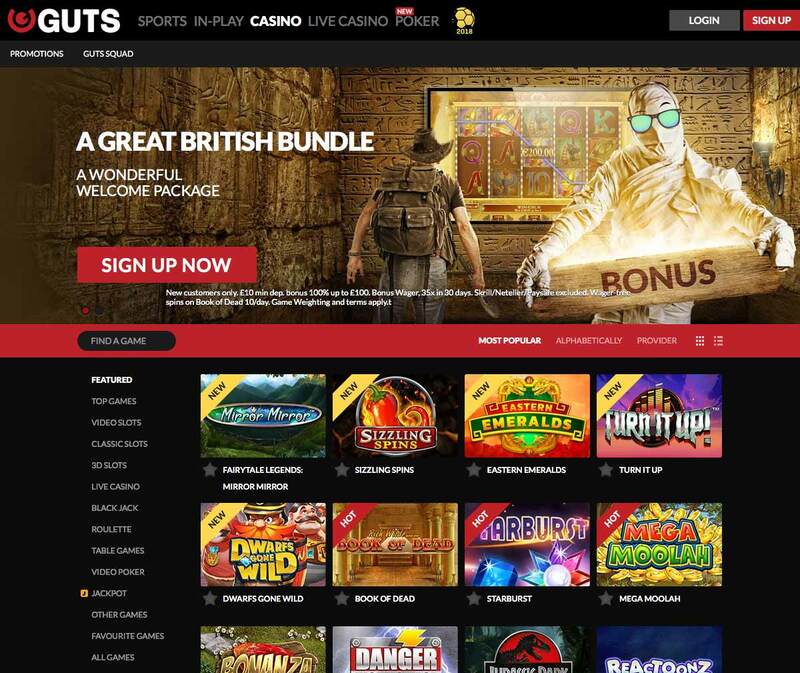 From these providers, Guts Casino has designed a portfolio of over 750 games. Majority of them, around 700 we would say, are slot games. You will likely find any slot game you are looking for on this site, because of this huge range. For casino table games, Guts Casino has partnered up with Microgaming. With the Quickfire platform, they are providing classic casino table games such as Poker and Blackjack. They provide unique gameplay and superior graphics in their games, so for an amazing gaming experience, you can play on the site. Microgaming has developed authentic sounds to make the gaming experience even better. The company has been in business since 1994, and over the years, the software provider has managed to reach new heights in terms of providing grander gaming experiences. Another big name associated with the Guts Casino portfolio is NetEnt. This is considered to be one of the biggest rivals of Microgaming. Instead of leaving out each of their strong suits, Guts Casino has combined games from both of these software providers to give the casino players the best of both worlds. Some of their biggest and most popular games are Jack Hammer, Starburst, and South Park. These games are extremely popular among regular casino goes, and they are also a part of the Guts Casino games’ list. We should also include Quickspin while talking about software providers because of their specialty in virtual slot games. They provide some of the most popular and superior quality virtual slot games there are, such as Sugar Trail, Genie’s Touch and Royal Frog. Of course, they have games of other sorts as well, but virtual slots are still their domain. Other two noteworthy software providers from the Guts Casino portfolio are Betsoft and Play N’ GO. Betsoft provides games in the 3D video slots genre and they have many different themes and interactive features within these games. These games are enough to hold your attention for hours, because of their great gameplay. As for Play N’ GO, the games are only available to play in the flash format. Their biggest feature is that each of their games is available in 30 languages, making them incredibly versatile. All the software providers associated with the Guts Casino site are noteworthy and reputable operators. They have games which are already popular on their own, which is why Guts Casino didn’t have to work independently to build up their reputation. If we talk about in categories, Guts Casino has more than 700 games in the slots category alone. It will be very hard to not find a particular slots game you have been looking for on this site. The slots are neatly divided into subcategories to make the searching easier. The categories include Classic Reels, with games like Wild Melon, Lucky Diamonds, and Irish Gold. The video slots category has special features such as multipliers and wild symbols. As for TV and movie show freaks, there are different themed slots such as Game of Thrones, South Park, and the Dark Knight Rises. Other than slots, there are options to play the classic table games, with various variants of them available on this site. There are a total of 13 blackjack games available to play. Some variations are Classic, European and American blackjack. There is also the Multi-hand option. For players who like a classic card game, there are Double Exposure and Pontoon Pro. Overall, the blackjack section of the Guts Casino is well designed with a good number of variations. As for roulette, there are 12 variations. If you are not into cards games, spinning might be your forte. The roulette variations include European, American and French roulette, as well as Premier and Multi Wheel games. Fans of Baccarat, on the other hand, don’t need to feel sad, as there is a version of Baccarat Pro available at your disposal. Baccarat is a fun and easy game, where players only need to make a bet and land at a number closest to 9 to win. If you are feeling lucky, you can try out the Punto Bunco, which depends solely on a chance to win. Guts Casino has a total of 10 variations available for Poker, which is quite a lot if you compare with even many reputable online casino sites. The poker games have a user-friendly interface with easy gameplay involved. Some popular variations of poker available at the Guts Casino are Texas Hold ém, Caribbean Stud, Pai Gow and Red Dog. If you don’t want to play the same old poker, opt for video poker. A video poker is simply a combination of virtual slots and classic casino poker. The game is easier to play with the outcome depending heavily on the players’ bets, which is what makes this game thoroughly enjoyable. The video poker section has 16 different categories, with some options being Jacks or Better, Deuces Wild, Joker Poker and Aces and Faces. Most of these games are from Microgaming’s Quickfire platform, with some mix in from the rival NetEnt. For players looking for something different other than slots and table games, they can opt for Keno and Bingo. These can be found in the Other Games section of the site. If you are bored after playing the same casino staples, you can test out these games to bring some dynamics into your gaming experience. Bingo, for example, is based mostly on luck, which is why it makes the game a particularly thrilling one. Some examples of popular bingo games are Mayan, Electric and Samba. As for Keno, there are options for Bonus and Classic Keno. There is also a scratch cards option, to play and see what luck has been keeping for you. Some popular scratch card options are Germinator, Caterpillar, Enchanted Woods, and Triangulation. These games are really easy to play and are more suitable for the novices. However, if you are looking to change your palate, these games are certainly a good option. The games come with special bonuses and features, so you can still win a decent amount of money from these. All these games are available for instant play. Some of the table games are available for the live casino as well. Over 350 of these games are available on the mobile site. Bonuses and promotional offers are available for both new and existing players. The site has a generous welcome bonus offer for the newly signed players. For making the first deposit, you will get a 100% match up bonus with up to £100. The second, third and fourth deposits will grab you another £200 each. The minimum deposit required to boost this welcome bonus is £10. The welcome bonus also includes free spins on some selected slots games. The wager requirements for the welcome bonus is 35X the bonus amount. The bonus rollover needs to be fulfilled within 30 days of claiming the bonus, otherwise, it will be forfeited. Payments done via Neteller, PaySafe and Skrill are not eligible for this welcome bonus. Note that different games have different weightings. For example, video poker and the table games don’t count towards the rollover. And the maximum allowed bet is £6 before you have cleared out the wagering requirements. Other than the welcome bonus offer, the existing players can also win other bonuses through the ongoing promotional offers. Reload bonuses are always being offered to give back to the loyal customers of Guts Casino. There is a special offer that runs through every Mondays of the week. The offer is for those who make deposits on Mondays. The reload bonus is 40% for up to £40 in play, with 15 extra spins on any virtual slots game you want. 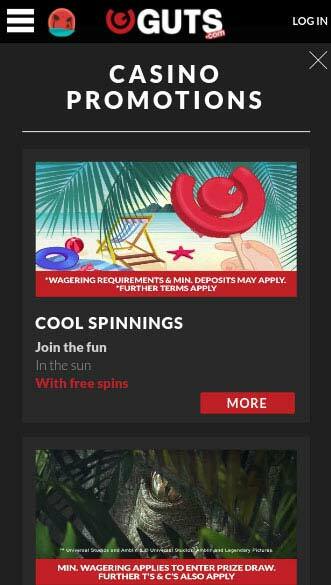 Additionally, the extra spins are not bound to any of the wagering requirements. Winnings from these spins will get credited to your account balance immediately. As of now, Guts Casino doesn’t have any Comp Points rewards system in place to have a loyalty program or VIP club. The only way to reward the loyal customers is through the above mentioned Monday offer. 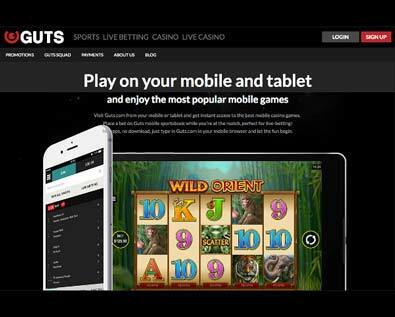 The Guts Casino site is mobile friendly with easy to navigate site that converts seamlessly onto the mobile screens. Out of the Guts Casino’s portfolio, over 350 of them are available on the mobile version of the site. The Guts Casino site don’t have a dedicated app for the mobile users right now. But the mobile version of the site doesn’t let that become an issue. Players who can’t spend much time in front of a desktop are in luck these days as most online casino sites run smoothly on the mobile sites as well. Guts Casino is another example of that technology. Players of the site can access the mobile site via any smartphone device. All you need to do is search the site through a browser and enter the site. The mobile site doesn’t require you to download anything. If you want to make it even easier, you can add the icon of the casino to your smartphone’s or tablet’s screen, and get access to the site with one touch. The mobile version of the site can be accessed from all popular devices such as Android, iOS, Nokia, Windows, and Blackberry enabled devices. The added features such as banking options, search bar, special offers all are part of the mobile version of the site. Basically, if you want to switch to the mobile site because of convenience, you totally can. If your favorite game is not part of the 350 games found on the mobile site, don’t worry, as more games are being added to the mobile site on a regular basis. If you want to play with a pro dealer without having to leave the house, the live casino is the way to go. You can totally use your skills and get the same vibe as you would in a real casino, without having to leave your bedroom. There are a total of 32 different table games and their variations available on the live casino site. There are 15 blackjacks, 8 roulettes, 5 baccarat, 3 card pokers and a Hold ‘em poker tables to choose from. The tables carry different amounts of bankrolls, so anyone with any budget can take part in the live casino games. The games are streamed live from a real casino setting. You can feel the vibe of being there personally, given you have a good internet connection. The Guts Casino site uses a number of payment methods to make it easier for the users to deposit and withdraw money. The available currencies are EUR, USD, AUD, CAD, GBP, NZD, NOK, and SEK. Keep in mind about the conversion rates while transferring money in a different currency other than Euro, as that is the Guts Casino’s preferred currency. Also, note that some countries don’t have all the payment methods available. The deposit can be done via MasterCard, Visa, Paysafecard, Skrill, Neteller, Ecopayz, iDEAL, InstaDebit, POLi, UseMyServices, PayPoint Card, Ukash, Sofortuberwaisung, Euteller, Trustly, WebMoney and bank wire transfer. For withdrawing the money, you need to choose one of the following methods from Skrill, Neteller, Visa, WebMoney and bank wire transfer. Some of these payment methods may not be available in your country, so do check first. There are fees associated when you make withdrawals from any of the mentioned methods. The fees are 2.50% for each withdrawal. For deposits, there are no additional fees, unless you are making them via bank transfer, in which case you will incur a 2.50% fee. We will recommend you to make the deposit via other methods rather than the bank transfer, as it will mean you are incurring a loss of 2.50% even before you start playing. The time interval for each withdrawal pending process is up to 24 hours. For eWallets, it tends to be almost within one day once the pending period is over. For debit and credit cards and bank transfers, it will take a maximum of 3 days. As for deposits, they will transfer to your accounts immediately. The minimum withdrawal amount is £20 and the maximum withdrawal amount is £5,000 per transaction. The minimum deposit is £10 and the maximum deposit amount is £5,000 per transaction. The Guts Casino site is superior when it comes to offering great customer support service. The live chat support is available 24/7 so any emergency issues can be fixed immediately. The agents are friendly and supportive, so don’t feel burdened or worried to reach out when in need. The customer support service is available in many other languages other than English, such as Swedish, Finnish and Norwegian, so don’t hesitate if English is not your first language. If you don’t need an immediate and would rather wait for an elaborate reply, you can opt for the email customer service instead. Reach out to them and you will most likely get a response within 24 hours. Their responses are always accurate and friendly, so don’t worry about not getting greeted properly. Alternatively, you can reach out via phone. For international users, the number is +350 200 43003 but it’s not toll-free. For customers from the UK, use the toll-free number 0800 032 1133. Guts Casino started the operation in 2013. It has been a while since they have been running the operation, and it’s a good thing that they are still on the run. Many online casino sites come and go within a year, so sticking to the job is a sign of success. The company is run by MT SecureTrade Limited Casinos, which is popular for running similar businesses over the years. The casino has three licenses from different gaming authorities – UK, Malta, and Curacao. The Guts Casino site is very secure because the site has an SSL encryption incorporated in it. This means all the data you put on the site about yourself are secure. Don’t worry about getting your identity stolen, as Guts Casino has been on the scene for a while and no such occurrences have taken place yet. The safe and secure site will make sure that your information is not sold to third party accounts in exchange for money. The Guts Casino is a fair policy follower and because of that, they used an advanced random number generator to find the results of all their games. The site ensures there are equal chances for you and a seasoned player winning the same amount of money from the same game. The Guts Casino site is accountable because they have to be if they want to keep their licenses from the authorities. Part of being in the business is being accountable for the customers’ money and other information, and Guts Casino is well adamant about doing that. The Guts Casino site is a great place to start playing casino games as they have quite a great range. The theme and overall vibe of the casino site are pretty unique, and the added background sounds of the individual slots, tables, and other games add to the atmosphere. If you are on the lookout for some new or old casino games, we will recommend checking out the Guts Casino site.